The Jets assigned Anderson, a restricted free agent, a second-round tender, Ian Rapoport of NFL Network reports. Analysis: Anderson can still sign an offer sheet with another team this offseason, but that team would have to send the Jets a second-round pick -- if the Jets don't choose to match the offer themselves. The three-year vet caught 50 passes for 752 yards and six scores over 14 games in 2018, but an atrocious 53-percent catch rate hinders his status as a game-breaking deep threat. Anderson caught three of eight targets for 24 yards in Sunday's 38-3 loss to the Patriots. He finishes the season with 50 catches for 752 yards and six touchdowns. Analysis: Anderson capped the campaign with a dud, but the speedster had been displaying excellent chemistry with quarterback Sam Darnold with 20 catches, 312 yards and three touchdowns in the previous three weeks. Continuity is key for a young quarterback, so the Jets are expected to bring back Anderson, who's a restricted free agent. Despite some inconsistency and injury struggles, Anderson was Darnold's most dangerous weapon this year. Anderson hauled in nine of 13 targets for 140 yards and a touchdown in Sunday's 44-38 loss to Green Bay. Anderson is expected to serve as the Jets' top receiving option in Week 16 against the Packers with Quincy Enunwa (ankle) ruled out for the contest. Anderson caught seven of 11 targets for 96 yards in Saturday's loss to the Texans. Analysis: Anderson took advantage of Quincy Enunwa's (ankle) absence and was quarterback Sam Darnold's clear top target Saturday, with no other pass catcher receiving more than five targets. The 25-year-old now has 11 catches for 172 yards and two touchdowns in the last two games, by far his best two-game stretch of the season. Enunwa's status for Week 16 will impact Anderson's outlook as he attempts to continue his solid production against the Packers. 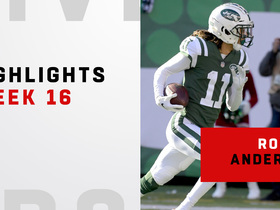 Anderson is expected to serve as the Jets' top receiver Sunday against the Texans with fellow starter Quincy Enunwa (ankle) ruled out for the contest, Rich Cimini of ESPN.com reports. Anderson (ankle) caught four of seven targets for 76 yards in Sunday's 27-23 win over the Bills. Anderson (ankle) is active for Sunday's game against the Bills. Anderson (ankle) was a limited practice participant Friday and is listed as questionable for Sunday's game in Buffalo, Rich Cimini of ESPN.com reports. Analysis: Anderson still hasn't made a full recovery from the ankle sprain he suffered in late October, but he seems to be on track to play for a third straight week, likely catching passes from rookie signal-caller Sam Darnold. Between the matchup, the injury and his recent lack of production, Anderson doesn't offer much fantasy appeal for Week 14. The Bills allow just 6.4 yards per pass attempt, and Anderson hasn't reached 50 yards in a game since Oct. 7. Anderson (ankle) took part in Friday's practice, Ethan B. Greenberg of the Jets' official site reports. Analysis: Anderson was limited at Thursday's practice after getting in a full session Wednesday, and it's still not clear why he did less than the day before. Regardless, he has still taken part in practice all three days this week, which bodes well in regards to his availability for Sunday's game in Buffalo. After practicing fully Wednesday, Anderson (ankle) was limited at practice Thursday, Eric Allen of the Jets' official site reports. Analysis: We'll have to see if the downgrade in participation is maintenance-related or indicative of a setback with the ankle issue Anderson has been dealing with of late, but Friday's practice and subsequent official injury report figure to lend clarity on that front. While Anderson's practice level dipped Thursday, fellow wideout Quincy Enunwa (ankle) practiced fully after being limited Wednesday. Anderson caught four of seven targets for 48 yards in Sunday's 26-22 loss to Tennessee. Analysis: Although his final line looked like nothing special, Anderson tied his season high in catches and saw his second-best receiving output on the year. The 25-year-old has been limited by injuries and an ineffective offense this season after coming just 59 yards shy of the 1,000-yard mark in 2017. Things don't get any easier with Buffalo's top-rated defense against receivers on tap in Week 14. Anderson (ankle) is active for Sunday's game against the Titans. Anderson (ankle) is listed as questionable for Sunday's game against the Titans, Darryl Slater of NJ.com reports. Analysis: After missing practice Wednesday, Anderson was able to work in a limited fashion the subsequent two days, so he seemingly has a good shot at suiting up Sunday. If he does, it remains to be seen if Sam Darnold (foot) or Josh McCown (thumb/back) would be throwing Anderson passes. In any case, Anderson -- when healthy -- has the speed to be a dangerous deep threat, but his only big game this season was back in Week 5, when he logged three receptions for 123 yards and two touchdowns. Anderson (ankle) was spotted on the field with a helmet at Friday's practice, Ethan B. Greenberg of the Jets' official site reports. Analysis: Anderson was held out of practice Wednesday but was able to get some limited work in the following day. He appears set to at least replicate that activity level Friday, if not step things up a notch. That bodes well for his chances of playing in Week 13 against the Titans, but his official status won't be revealed until after practice concludes. Anderson (ankle) was a limited participant in Thursday's practice, Andy Vasquez of The Bergen Record reports. Anderson (ankle) was present for practice Thursday, Brian Costello of the New York Post reports. Analysis: Anderson didn't practice Wednesday, but his return to the field -- in any capacity -- would appear to have him trending toward active status in Week 13, assuming he ends up being officially listed as either a limited or full participant Thursday. Anderson (ankle) didn't practice Wednesday, Rich Cimini of ESPN.com reports. Analysis: Anderson played 48 of of the Jets' 64 offensive snaps in the Jets' Week 12 loss to the Patriots, so there's a decent chance that Wednesday's absence was maintenance-related. 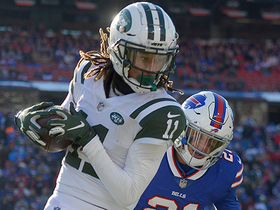 The wideout first appeared on the Jets' injury reports with the ankle issue back in late October and sat out Week 10 against the Bills, though he didn't appear to suffer an aggravation in his return to action coming off a Week 11 bye. Anderson (ankle) caught two of five targets for 22 yards in Sunday's 27-13 loss to New England. Analysis: Anderson still isn't 100 percent healthy, and his ankle injury has been particularly burdensome since Anderson's game revolves around speed. Until he gets closer to full health, look elsewhere. Anderson and the Jets will travel to Tennessee in Week 13. Anderson (ankle) is listed as active for Sunday's game against the Patriots. Analysis: Per Ian Rapoport of NFL Network, Anderson is a candidate to handle a limited role in his return to action Sunday, so there are safer Week 12 fantasy options out there. Once fully healthy, Anderson will compete for targets in the Jets' passing attack with the likes of Quincy Enunwa and Jermaine Kearse, a context that figures to make him a hit-or-miss fantasy option. Anderson (ankle), who is listed as questionable for Sunday's game against the Patriots, is expected to play but will likely handle a limited role, Ian Rapoport of NFL Network reports. Anderson (ankle) is listed as questionable for Sunday's game against the Patriots, Rich Cimini of ESPN.com reports. Analysis: Anderson missed two of the Jets' three games before a Week 11 bye due to an injury that was between a high-ankle and low-ankle sprain. After sitting out the first two post-bye practices this week, he was spotted with a helmet at Friday's session, according to Ethan B. Greenberg of the Jets' official site. The appearance eventually translated to a limited showing, with Anderson's availability Sunday potentially coming down to the 1:00 PM ET kickoff. Anderson (ankle) was spotted with a helmet at Friday's practice, according to Ethan B. Greenberg of the Jets' official site. Analysis: Anderson did not practice the last two days, but it looks like he will have a chance to get some work in at Friday's session. While this bodes well for Anderson's chances of playing in Week 12, it should be noted he was spotted with a helmet at Friday's session two weeks ago and was ultimately listed as doubtful, so his status will remain uncertain until the Jets release their final injury report of the week. Anderson (ankle) wasn't spotted on the field during the open portion of Thursday's practice, Brian Costello of the New York Post reports. Analysis: The wideout wasn't involved in pre-practice stretching and wasn't seen taking part in individual work, suggesting he'll go down a non-participant on the Jets' practice report for the second straight day. The lack of activity coming out of the Week 11 bye seemingly doesn't bode well for Anderson's chances of avoiding a second straight absence Sunday against the Patriots. Anderson (ankle) wasn't present for Wednesday's practice, Brian Costello of the New York Post reports. Analysis: Anderson still has time to return to practice as the week rolls along, but the fact that he's still unable to work coming out of the Jets' bye week isn't a great sign for his availability for Sunday's game against the Patriots. Anderson (ankle) isn't practicing Monday, Connor Hughes of The Athletic reports. Analysis: The Jets are still banged up after a Week 11 bye, with both Anderson and Sam Darnold (foot) held out of Monday's practice. The team won't release an official injury report until Wednesday, so there's still plenty of time for Anderson to get in some work before Sunday's game against the Patriots. Anderson (ankle) is inactive for Sunday's game against the Bills. Analysis: With Anderson out, Quincy Enunwa (ankle) and Jermaine Kearse are slated to serve as QB Josh McCown's top wideout targets Sunday. Anderson (ankle) is listed as doubtful for Sunday's game against the Bills. Analysis: While Anderson is almost assuredly out this weekend, Quincy Enunwa (ankle) is in line to play, which sets the stage for Enunwa and Jermaine Kearse to serve as QB Josh McCown's top wideout targets this weekend. Anderson (ankle) was spotted at Friday's practice with a helmet, Ethan B. Greenberg of the Jets' official site reports. Analysis: Anderson sat out the Jets' first two practice sessions of the week, but it appears he will be able to get some work in Friday. The Jets will reveal whether or not he will have a chance to take the field Week 10 after practice comes to a close. Anderson (ankle) wasn't spotted at Thursday's practice, Brian Costello of the New York Post reports. Anderson (ankle) didn't practice Wednesday, Darryl Slater of NJ.com reports. Anderson (ankle) caught four of six targets for 32 yards during Sunday's 13-6 loss to the Dolphins. He also gained one yard on one carry. Analysis: Anderson returned to the lineup after sitting out last week against the Bears, finishing second on the team in targets. Unfortunately, he managed little outside of a 17-yard gain and finished with rather pedestrian numbers. Anderson has become known as a deep threat during his time in the NFL, so his production is often lacking if he's unable to break off a long play or two. He'll look to do just that next Sunday against the Bills. Anderson (ankle) is listed as active for Sunday's game against the Dolphins. The Jets are optimistic Anderson (ankle) will be able to play Sunday at Miami, Adam Schefter of ESPN reports. Anderson is listed as questionable and is considered a game-time decision. Analysis: Anderson was able to practice Friday in a limited fashion after missing practices Wednesday and Thursday. He'll test his ankle injury out in pregame warmups before the Jets make a ruling on his status, which will be confirmed when the team releases its inactive list approximately 90 minutes prior to the 1 p.m. EST kickoff. Anderson (ankle) is listed as questionable for Sunday's game against the Dolphins. Anderson (ankle) suited up for Friday's practice but was working on the side during the media-viewing portion of the session, Eric Allen of the Jets' official site reports. The Jets listed Anderson (ankle) as a non-participant at Thursday's practice, Darryl Slater of NJ.com reports. Anderson (ankle) wasn't spotted on the field for the start of practice Wednesday, Rich Cimini of ESPN.com reports. Analysis: Anderson still has some time to get back in the mix as Sunday's game against the Dolphins approaches, but his continued absence from practice clouds his Week 9 status. Meanwhile, Quincy Enunwa (ankle) was at practice Wednesday, so at least one of the Jets' key injured wideouts is trending in the right direction as the weekend approaches. Anderson (ankle) is inactive for Sunday's game against the Bears. Anderson (ankle) is listed as doubtful for Sunday's game against the Bears. 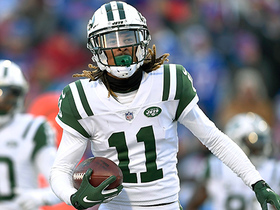 Analysis: With Quincy Enunwa (ankle) out this week and Terrelle Pryor no longer on the roster, Anderson's likely absence taxes the Jets' Week 8 wideout corps. Jermaine Kearse is thus the team's top healthy top option at the position, with Andre Roberts a candidate to see added snaps Sunday. Meanwhile, newcomer Rishard Matthews could be quickly pressed into a role in the Jets offense this weekend. Anderson (ankle) was not spotted during the portion of Friday's practice open to the media, Brian Costello of the New York Post reports. Analysis: It's possible Anderson could get some work in behind the scenes Friday, but it's looking like he will sit out practice for a third day in a row. The Jets will reveal whether or not he has any chance to play Sunday in Chicago when they release their final injury report of the week following Friday's practice. Anderson (ankle) didn't participate in Thursday's practice, Andy Vasquez of The Bergen Record reports. Anderson didn't practice Wednesday due to ankle injury, Darryl Slater of NJ.com reports. Analysis: With Quincy Enunwa (high-ankle sprain) sidelined for another week and Terrelle Pryor no longer on the roster, Anderson could be busy Sunday against the Bears, assuming his ankle issue ends up being minor. Anderson and Jermaine Kearse currently rank as the top two wideouts sans Enunwa, but that could change if the newly signed Rishard Matthews demonstrates a quick rapport with rookie quarterback Sam Darnold. It's unclear how sizable Matthews' role will be in Week 8, however. Anderson caught three of 10 targets for 44 yards in Sunday's 37-17 loss to Minnesota. Anderson (hamstring) was listed as a full participant in Thursday's practice, Darryl Slater of NJ.com reports. Anderson (hamstring) was on the field for the start of Thursday's practice, Rich Cimini of ESPN.com reports. Analysis: Anderson was listed as a non-participant in the Jets' first practice of the week, but it appears he'll at least upgrade to a limited session Thursday. The Jets will provide clarity on the extent of Anderson's involvement when they submit their practice report later in the day. There's been no indication thus far from the team that Anderson is in major jeopardy of missing Sunday's game against the Vikings, and his return to practice seemingly supports that notion. Anderson didn't practice Wednesday due to a hamstring injury, Darryl Slater of NJ.com reports. Analysis: Terrelle Pryor (groin) also missed Wednesday's practice, while Quincy Enunwa (ankle) is on track to sit out multiple games. Anderson's absence from practice is a notable development given the banged-up state of the Jets' receiving corps, but it's not yet known if he's actually in any danger of missing Sunday's game against the Vikings. 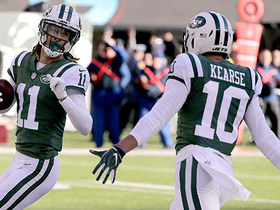 If Anderson is ultimately able to go, he and Jermaine Kearse would work as the Jets' top two receivers in Week 7. Anderson caught three of five targets for 39 yards in Sunday's 42-34 win over the Colts. Analysis: Anderson could have had a much bigger day, but he dropped a perfectly thrown deep ball in the end zone. The Jets are starting to open up the playbook more for rookie quarterback Sam Darnold, which bodes well for the speedy Anderson's fantasy outlook moving forward. Anderson could also receive a temporary boost in workload against the Vikings in Week 7, as Quincy Enunwa (ankle) and Terrelle Pryor (groin) are dealing with injuries. Anderson caught three of five targets for 123 yards and two touchdowns during Sunday's 34-16 win over Denver. Anderson won't receive a suspension from the league as a result of his two arrests within the past year and a half, an NFL spokesman informed Manish Mehta of the New York Daily News. Anderson had just two catches for 18 yards on six targets in Sunday's 31-12 loss to Jacksonville. Anderson (nose) returned to Thursday's contest against the Browns, Connor Hughes of The Athletic reports. Analysis: Anderson injured his nose after fumbling earlier in the game, but appears to be okay. The 6-foot-3 wideout caught his second pass of the game for five yards after returning to the field. Anderson suffered a nose injury in Thursday's game against the Browns and is questionable to return. Analysis: Anderson turned his first catch of the night into a 17-yard gain, but was subsequently stripped by rookie cornerback Denzel Ward, turning the ball over. To add insult to injury, Anderson appeared to be bleeding from his nose following the play. If he is unable to return, Terrelle Pryor and Andre Roberts figure to see an expanded role in the Jets passing game. Anderson caught three of five targets for 27 yards and lost a fumble in Sunday's 20-12 loss to Miami. Analysis: Anderson lost a costly fumble near midfield in the second quarter, as Miami found pay dirt two plays later. The speedy receiver seemed to lose quarterback Sam Darnold's trust after that and was outplayed by both Quincy Enunwa (92 yards on 11 targets) and Terrelle Pryor (84 yards on eight targets). Anderson is unlikely to approach the team targets lead most weeks, making him a boom-or-bust option reliant on hauling in the deep ball like he did in Week 1. Anderson's only target resulted in a 41-yard touchdown in Monday night's 48-17 rout of the Lions. Anderson's case remains under review for potential NFL discipline, Rich Cimini of ESPN.com reports. Anderson caught one of two targets for four yards in Thursday's 15-13 preseason loss to Washington. Analysis: Anderson played all 23 first-half snaps along with quarterback Sam Darnold, so it's a bit discouraging that the two didn't link up more often. Darnold hasn't really uncorked the deep ball yet, and the speedy Anderson does his best work downfield. 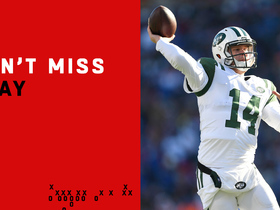 New York's playbook should open up more when the games start counting, so it's too early to push the panic button. Anderson caught his lone target for eight yards during Friday's 17-0 win over the Falcons in the preseason opener. Analysis: Anderson's lone catch came during New York's second drive on a pass thrown by Teddy Bridgewater. While the speedy wideout showed excellent downfield chemistry with Josh McCown last season, he's poised to thrive regardless of who's throwing him the ball this year. The biggest concerns regarding Anderson have to do with off-the-field issues, as he may still be handed a short suspension for getting arrested twice in the past year. Anderson's case is still being reviewed by the NFL under its personal-conduct policy, Rich Cimini of ESPN.com reports. Anderson's attorney, Ed O'Donnell, said that his client pleaded no contest Wednesday to charges of reckless driving stemming from a January arrest, Mike Garafolo of NFL Network reports. Analysis: After the plea, Anderson is no longer facing charges from either of his two arrests the past 13 months. He'll still face six months of non-reporting probation for the January incident, but neither legal issue should impact his preparation for the upcoming campaign. The wideout is still awaiting a potential fine and/or suspension from the league for violating the personal conduct policy, with an NFL spokesman relaying Thursday that a review of both incidents is ongoing. Anderson said last week that he doesn't expect the NFL to suspend him, despite being arrested twice in a nine-month span, Rich Cimini of ESPN.com reports. Anderson is no longer facing a felony charge from his arrest in May 2017, Mike Garafolo of NFL Network reports. Felony charges against Anderson have been dropped stemming from his Jan. 19 arrest in Broward County, Fla., Andy Slaterof 940 AM WINZ reports. Anderson's trial hearing for felony resisting arrest was originally scheduled for Monday, but it's been postponed until Aug. 6, Rich Cimini of ESPN.com reports. Anderson pleaded not guilty Monday in Broward County (Fla.) Circuit Court to the nine charges he faces stemming from his Jan. 19 arrest, Darryl Slater of NJ.com reports. Analysis: The 24-year-old Anderson faces three felony charges, a misdemeanor and five traffic violations, according to the arrest report. It's the second straight offseason for Anderson that has been clouded by legal issues, as he was previously arrested last May for pushing a police officer during a dispute at a Miami music festival. Anderson will report to court March 26 to address that incident, though it remains unclear when his trial for the Jan. 19 arrest will commence. Anderson reportedly faces nine charges, including two felonies, stemming from an incident in South Florida early Friday morning, according to ESPN's Rich Cimini. Analysis: Per the report, this marks Anderson's second arrest in the last eight months. With the NFL slated to review the matter, the wideout is potentially subject to discipline under the league's personal-conduct policy. Meanwhile, the Jets released a statement, noting that the team is "aware of the situation. This is a pending legal matter and we will have no further comment." Anderson was evaluated for a head injury during Sunday's game against the Patriots. Analysis: Prior to that, Anderson was having a quiet game, logging just one catch on three targets for two yards. 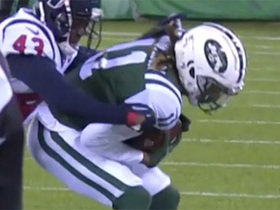 With the Jets down in the contest, the wideout could end up staying out for precautionary reasons. Anderson (illness) does not carry an injury designation for Sunday's game against the Patriots. Analysis: While the wideout's yardage output has been modest of late with Bryce Petty at QB for the Jets, Anderson is still seeing his share of volume. He's logged 19 targets over his last two games, which has resulted in back-to-back five-catch performances. Anderson (illness) returned to a limited practice Thursday. Analysis: Anderson's return to practice puts him on track to play Sunday against the Patriots, an outcome that will be solidified if the wideout is removed from the Jets' Week 17 injury report come Friday. Anderson's receiving yardage has been modest of late, with Bryce Petty at quarterback, but the wideout is still seeing volume, parlaying 19 targets over his last two games into back-to-back five-catch efforts. Anderson missed Wednesday's practice with an illness, Connor Hughes of NJ.com reports. Analysis: Anderson should have time to get healthy before Sunday's game in New England, but he'll still be stuck with Bryce Petty as the starting quarterback. The speedy wideout has been limited to 13 catches for 118 yards on 25 targets over the past three weeks, derailing what appeared to be a sure-thing 1,000-yard campaign. He still has a shot to get there, needing 61 yards in the finale. Anderson caught five of seven targets for 51 yards in Sunday's 14-7 loss to the Chargers. Analysis: Anderson was the intended target in the end zone on a desperation fourth-down pass by Bryce Petty trailing by a touchdown in the fourth quarter, but that throw was predictably nowhere near its target. With quarterback Josh McCown (hand) sidelined, New York's passing game has gone into the gutter and will be hard to trust in next week's finale at New England. Anderson (hamstring/hip) was a full participant in Thursday's practice. Anderson (hamstring/hip) was limited at Wednesday's practice. Analysis: We'll track Anderson's status as Sunday's game against the Chargers approaches. The wideout saw a team-high 12 targets in Week 15's loss to the Saints, but that only led to five catches for 40 yards. He'll look to click better with QB Bryce Petty this weekend, but that will be easier said than done, with Los Angeles representing a tough matchup. Anderson caught five of 12 pass attempts for 40 yards in Sunday's 31-19 loss in New Orleans. Analysis: The 24-year-old was by far the Jets' most-targeted receiver on the day; no one else saw more than five. Although it didn't add up to a big statistical day, it did continue the trend established last season when Bryce Petty was under center. While the Temple product will likely continue to see large volume, he has an extremely difficult Week 16 matchup with the Chargers. Anderson displayed a strong rapport with quarterback Bryce Petty in 2016 and could be a go-to option over the Jets' final three games for the signal caller, who will make his first start of the season Sunday against the Saints, Rich Cimini of ESPN.com reports. Anderson caught three of six pass attempts for 27 yards in Sunday's 23-0 loss to the Broncos. Analysis: Along with Jermaine Kearse, Anderson was the Jets' most-targeted receiver on the day. It couldn't salvage the 24-year-old's streak of six consecutive games with 100 yards or a touchdown, as New York wasn't able to sustain drives long enough for anyone to accumulate any stats. Anderson will try to rebound in Week 15 at New Orleans but will find it tough with Bryce Petty likely filling in at quarterback. Anderson (hamstring) was a full participant at Friday's practice and will play in Sunday's road game against the Broncos, Manish Mehta of the New York Daily News reports. Rich Cimini of ESPN.com relays that Anderson was unable to complete practice Thursday after aggravating his hamstring. Analysis: In the wake of Thursday's setback, the surging wideout's status for Sunday's game against the Broncos must now be monitored. If Anderson is unable to play this weekend, Chad Hansen and ArDarius Stewart could see added looks in the Jets' Week 14 passing attack. Anderson (hamstring) was limited at Thursday's practice, Eric Allen of the Jets' official site reports. Analysis: Though listed on the team's injury report Wednesday, Anderson was a full participant, so we'll have to see if the wideout's limitations Thursday were maintenance-related or the result of a setback with his hamstring. Anderson has been productive of late, working well with veteran QB Josh McCown. Earlier on, a road date in Denver looked like a matchup to avoid, but the Broncos have lost eight straight games in advance of Sundsay's tilt against the Jets. Anderson brought in eight of 12 targets for 107 yards in Sunday's 38-31 win over the Chiefs. Anderson caught six of 10 passes for 146 yards and two touchdowns in Sunday's 35-27 loss to Carolina. Anderson brought in four of seven targets for 85 yards and a touchdown in Sunday's 15-10 loss to the Buccaneers. Anderson hauled in four of five targets for 48 yards and a touchdown in Thursday's 34-21 win over the Bills. Analysis: The 24-year-old speedster scored his third touchdown in as many games early in the third quarter, beating double coverage down the right sideline. Anderson has seen no less than five targets in seven straight contests and appears to be solidifying his rapport with quarterback Josh McCown on a weekly basis. He'll look to take advantage of the vulnerable Tampa secondary in Week 10. 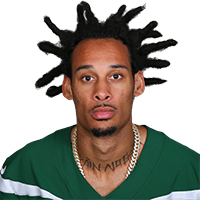 Watch the best plays from New York Jets wide receiver Robby Anderson Week 16 when he faced the Green Bay Packers. New York Jets quarterback Sam Darnold finds wide receiver Robby Anderson for a 33-yard touchdown. 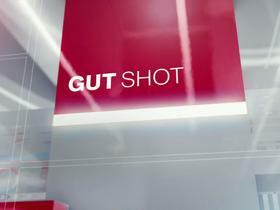 NFL Network's "NFL Fantasy Live" crew highlights players they believe are poised to have big performances in Week 16. New York Jets wide receiver Robby Anderson gets UP to make sideline grab. 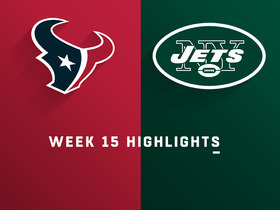 Check out the full game highlights from Houston Texans vs. New York Jets Week 15 matchup. 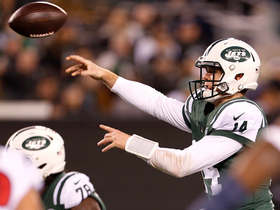 New York Jets quarterback Sam Darnold gets Jets into end zone with on-the-run TD throw. New York Jets wide receiver Robby Anderson speeds across the field to get Jets into red zone. New York Jets quarterback Sam Darnold turns a wild scramble into an epic touchdown pass to wide receiver Robby Anderson from 7 yards out. New York Jets quarterback Sam Darnold soars pass down field to wide receiver Robby Anderson for 25 yards. 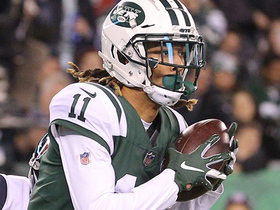 New York Jets wide receiver Robby Anderson makes a crucial catch for a 37-yard gain.